The input is unbalanced. If you are running a balanced signal into it, leave ground floating. I had some bad hum with ground tied to negative. It went away when I cut the ground wire at the radio end. The final problem is that if you keep the Tx switch closed on power-on, the radio won’t transmit. To get around this, you can unplug the RJ45 connector when you turn it on. For unattended operation, this isn’t ideal. 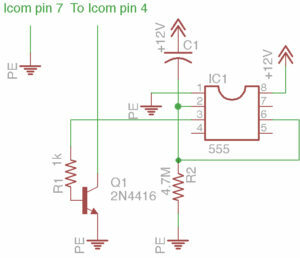 The alternative is to use a 555 timer circuit to delay the connection of the transmit contact. I ended up using a 1 µf electrolytic capacitor and a 4.7M ohm resistor at 12 volts for a delay time of about 6.5 seconds. Interestingly, the transmit contact isn’t a dry contact. There’s about 5 volts across it. 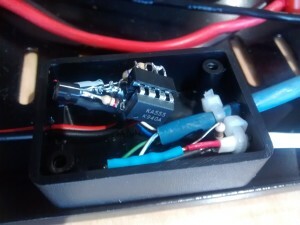 This means it’s easy to use an NPN transistor (I used a 2N4400, not a 2N4416,) turned on by the 555 timer, to connect Tx + to ground. The 555 and the Tx – shares a ground. 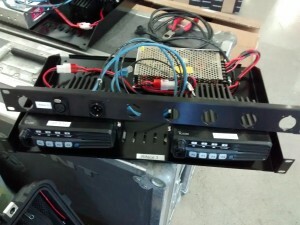 I was able to fit all of this into a very small box from AllElectronics.